According to Apple, the the new MacBook's key assembly is about 40 percent thinner than previous designs and was necessary to keep the entire machine under 0.52 inches thick at its deepest point. 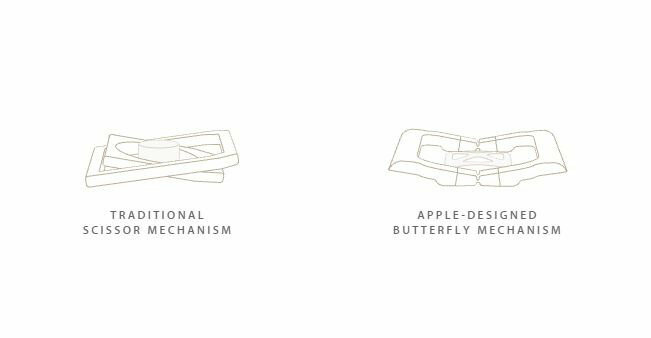 Executing such a radical design with traditional scissor-switch keys would have cause keycaps to wobble and bottom out without registering a stroke, so Apple introduced something called the "butterfly" mechanism. Scissor-switches are composed of two separate, relatively tall hinges, and will often descend in one corner first as a key is depressed. The "wings" of the butterfly mechanism, as seen below, tout comparatively shallow displacement and bend in unison since they're part of a single assembly crafted from stiffer materials. The butterfly design not only improves typing precision, but importantly reduces thickness. As a trade-off, these types of keys offer very little travel, which could take some getting used to, but probably won't be an obstacle in an era of touchscreens that boast no feedback whatsoever. On the comfort front, Apple was able to enlarge key surface area by 17 percent, offering users a larger target to strike when typing. Additionally, a new stainless steel dome switch undergirding the butterfly mechanism provides a solid feel and positive feedback. A further space-saving measure involves the way keyboard backlighting. Many notebooks simply use one set of LEDs routed through a diffuser —or fiber optics in older Apple laptops —to light up the entire keyboard, but the new MacBook boasts separate lights under each key. The setup promises energy efficiency and uniform brightness without any light spillage around key edges. One final change has little to do with space, precision, or other practical matters. Apple has used the same font —VAG Rounded —on its keyboards since 1999. The 2015 MacBook is the first computer to employ San Francisco, an Apple-designed font initially introduced to make text on the Apple Watch more legible. That's unlikely to be an issue on a notebook keyboard, so the more plausible explanation for using the typeset on the MacBook is that San Francisco creates a common aesthetic across Apple's product lines while avoiding licensing fees. VAG Rounded was originally designed for Volkswagen in the late 1970s by GGK Dusseldorf, although the carmaker abandoned it in the early 1990s. It has since been used by companies such as T-Mobile and Adecco, and is now licensed by Adobe. The new MacBook is due to ship on April 10 at a base cost of $1,299. Beyond its keyboard, it will sport a Retina display, a Force Touch trackpad, and just a single USB-C port for both input/output connections and charging.